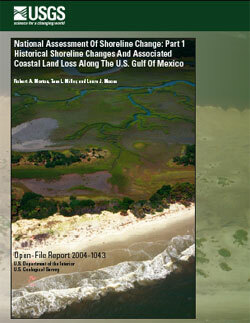 "National Assessment of Shoreline Change: Part 1, Historical Shoreline Changes and Associated Coastal Land Loss Along the U.S. Gulf of Mexico" is a 44-page, full-color discussion of historical shoreline change and coastal land loss along the U.S. Gulf of Mexico. NOTE: You will need to have the free Adobe® Reader (v3.0 or higher) installed on your computer to view and print this publication. Once you have Adobe® Reader installed, click the "OFR 2004-1043 - 3.7 MB PDF" link.